Shake together all vinaigrette ingredients. Divide vinaigrette evenly into four 1-pint/2-cup glass jars. 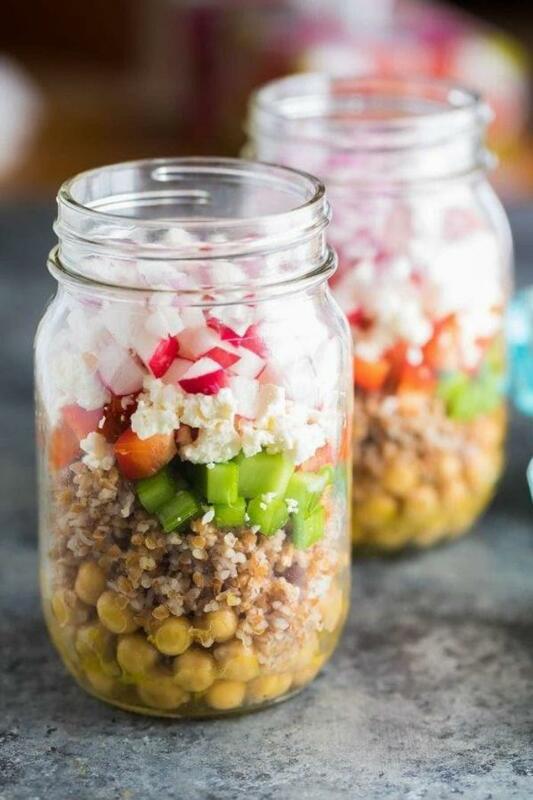 Add the chickpeas to the bottom of each jar, and top with quinoa, celery, bell pepper, feta cheese, radish and red onion. To serve, shake the salad out into a large bowl and stir up to distribute the vinaigrette. 1Shake together all vinaigrette ingredients. 2Divide vinaigrette evenly into four 1-pint/2-cup glass jars. 3Add the chickpeas to the bottom of each jar, and top with quinoa, celery, bell pepper, feta cheese, radish and red onion. 4To serve, shake the salad out into a large bowl and stir up to distribute the vinaigrette.